OhGizmo! 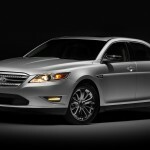 Reviews The Ford Taurus 2010 | OhGizmo! After spending a day with the car in a snaky mountain drive from Knoxville to Asheville, I came away impressed and with a new outlook on a vehicle I wouldn’t have thought about even twice just a few years earlier. For its target market, the Taurus hits a sweet spot; an engaging mix of class-leading technology, muscular and elegant design, and exceedingly civil road manners. While there are some minor issues that I’ll address in the body of this review, Ford may just have hit on a product that could allow it to pull ahead of its rivals. After all, simply “still being around” isn’t quite enough. With the Taurus, they seem to be bringing their A-game. In this review, I’ll mainly focus on the plethora of gadgets and technological features that make the Taurus not only an enjoyable drive, but a treasure trove for any gadget lover. OhGizmo! is, after all, a gadget site. But let me spend at least a little bit of time telling you about the car, the engine and how it feels on the road. 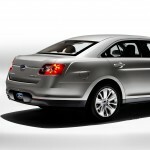 The Taurus comes in several models: the SE, SEL, Limited and SHO. 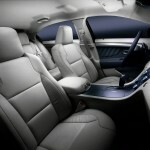 Prices start at $25,995 and go up from there to $37,995 for the SHO, before optional features. I got a chance to drive a Limited and a SHO. The SHO review comes later this week. Pictures will say a lot more about this than my words ever could. Of course, you could argue that beauty is in the eye of the beholder, but if you ask me, Earl Lucas (Exterior Design Manager) and Lon Zaback (Interior Design Manager) did an excellent job of not only refreshing the design, but outright transforming what I always considered a bland, dowdy car into something even this 28-year old wouldn’t mind being seen in. Considering Ford’s target market for the vehicle is the family man “who’s still excited about driving”, they seem to have hit the nail right on the head. The exterior is athletic and linear, the aesthetics relevant and appealing. The interior is crafted with care and symmetry; attention given to seemingly unimportant details with a degree of enthusiasm that exudes from Lon’s impassioned narrative. But again, see for yourself in the small gallery below. 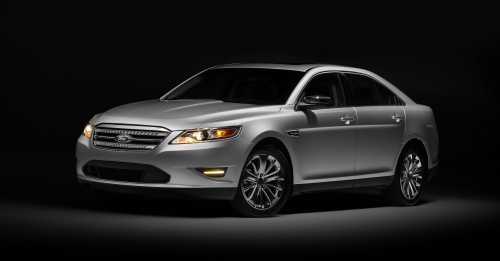 The 2010 Taurus comes with a Duratec 3.5L DOHC V6 engine that produces 263 hp and 249 ft-lb of torque, transmitted to the wheels via a 6-speed SelectShift Automatic transmission with steering wheel paddles (not on SE). It’s a decent, durable engine with what I remember being decent mileage figures. They were tossed around a few times during presentations, but they are conspicuously absent from any of the official press literature. So don’t quote me on this, but it’s something along the lines of 28/18mpg for front wheel drive and maybe 26/16mpg for AWD. Chassis and suspension components are tuned for a sporty and aggressive feel with optimized roll stiffness for cornering control, responsive steering with sharp turn-in and precision accuracy. So, how is it? Well, first the good. The car is smooth. Sipping hot coffee down a bumpy road sort of smooth. Yet, the suspension and chassis are stiff enough that there’s very little roll in sharp corners and you quickly gain confidence in the car’s handling. It has a slight tendency for understeer, but only very slightly so. The steering is precise, although somewhat uncommunicative. This is not necessarily a problem, it’s my personal taste: I like sports cars and this is a full-size family sedan with sporty aspirations. Not the same thing. Additionally, tremendous amount of effort was poured into making the car silent. It worked. Even at speeds that exceed the limit by a, um, unspecified amount, there was barely any wind or road noise. I cannot stress this point enough: the car is whisper quiet, much more so than cars in its segment costing considerably more (I’m looking at you, Audi A6). The bad? Well… Going and stopping, basically. As much as 263 hp may seem like a decent figure, it’s not nearly enough to haul 4,224lbs around. And again, this is not meant to be a sports car, yet I often felt that the power curve required me to squeeze excessive amounts of RPM before producing any sort of meaningful acceleration. And although the shifts via the SelectShift paddles were surprisingly quick, the feel of the plastic paddles was disappointing. Imprecise. While Ford’s attention to haptics in the Taurus is top-notch, the paddles are a weak point. Finally the brakes, while doing an excellent job at actually stopping the car, felt a little too springy for my taste. Too much foot travel before any meaningful stoppage occurred. Despite these small flaws, the Taurus handles great, feels at ease on the road and will enjoy and respond to the occasional aggressive drive. 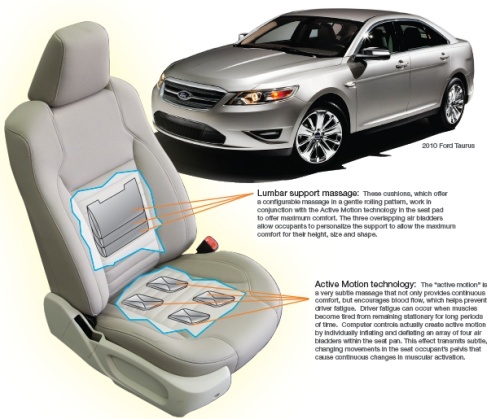 The car’s biggest strength however comes from this next section, the technology. The Taurus has in its arsenal 10 class-exclusive features that make it stand out against its rivals, some of which cost a truckload more. Here’s a rundown of my favorites. 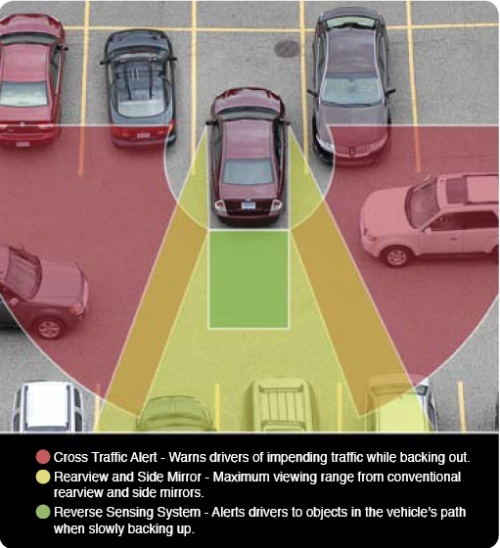 – BLIS (Blind Spot Information System) with Cross Traffic Alert. 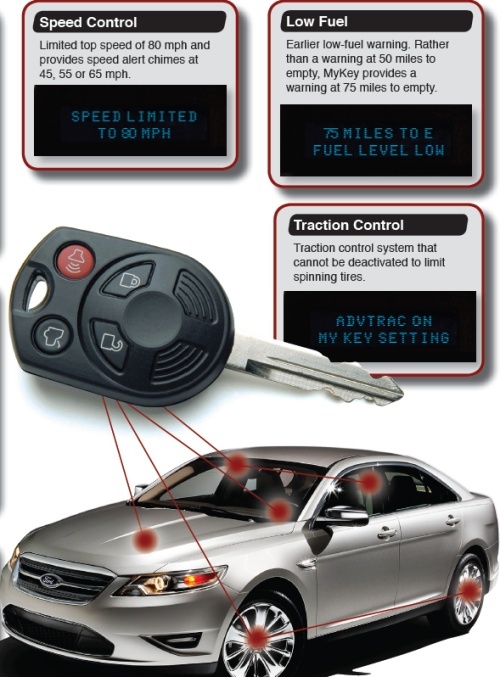 The vehicle can pack two sets of radars, one of which is used for this feature. 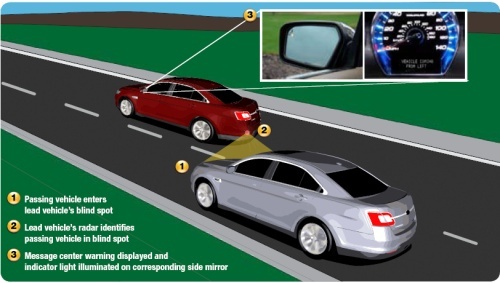 Mounted in the rear side wings, this radar monitors a wedge of road directly in the driver’s blind spot. Should any car enter this space, an LED lights up in the corresponding sideview mirror to warn the driver. I tested this, it works perfectly. This same radar is used differently in a parking environment. 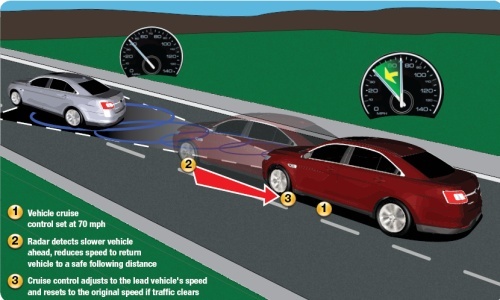 Once reverse is activated, it will monitor a different wedge, perpendicular to either side of the backing up vehicle, warning the driver of an oncoming car even before visual contact can be made. 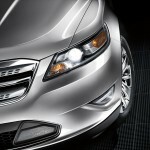 The other radar is mounted on the front of the car and is used to make cruise control something you might actually use. It will keep your car at a safe distance from slower moving cars by monitoring the traffic ahead, and slowing you down gradually to a pre-selected distance (short gap, medium gap, large gap). I tested this and can confirm that it’s seamless and smooth. You no longer have to keep disengaging and re-engaging CC every time some slow poke cuts you off. This same radar is also used in a different setting to help prevent a collision. If you’re coming up on some obstacle and you’re not slowing down, the car will project a set of lights up on the windshield, will sound an alarm while muting the radio and will pre-load your brakes for maximum braking power. That way, once you finally touch the brakes, the car will execute a hard stop much faster than your own feet possibly could. It will not however brake for you, for reasons that the engineer responsible couldn’t quite elucidate for me. It sounded like they didn’t feel right designing a car that would “stop for you”. It also sounded like they were worried the system might make a mistake and end up braking needlessly all over the place. One can understand why this is a valid concern. This is quite probably my favorite feature. Remember who this car is aimed at: the family man. Someone who might very well end up having to lend the Taurus to his or her 16-year old. What better feature than to have a special key for them that you can pre-program with a set of, say, parental controls? The MyKey allows you to set the following. Traction Control: can’t spin tires anymore, kiddo. Insistent Belt Minder: gotta buckle up, son. Speed Control: think you’re gonna drag race in my Taurus? Think again. Low Fuel Warning: the system can start nagging 75 miles before empty, instead of 50. Ford even surveyed teens about this feature. While most said they didn’t like it, they conceded they might accept it if it translated into more driving privileges for them. Ever been on long road trips? Hurts the posterior and, well, pretty much everything. This feature consists of a set of inflating bladders that inflate and deflate in a random pattern to help shift pressure points around. I tried this out, and it feels sort of nice, although my trip wasn’t long enough to bore out any conclusions on its ability to prevent soreness. These are the features I enjoyed the most, however, there are plenty, plenty more. I’m even leaving a few out. For the price, this car is a gadget lover’s paradise. 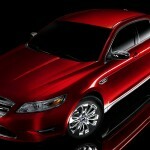 The 2010 For Taurus is not the same car that’s been around for over two decades. It’s new inside and out, and has been injected with a healthy dose of dynamism. It looks good, feels good, drives really really well and most importantly for geeks, is packed with more gadget-y features than you can shake a USB stick at. It seems like the right car at the right time for Ford. It just remains to be seen if their marketing department will manage to get the message out. What a review!! I Think It's going to be my next car! Thanks David!